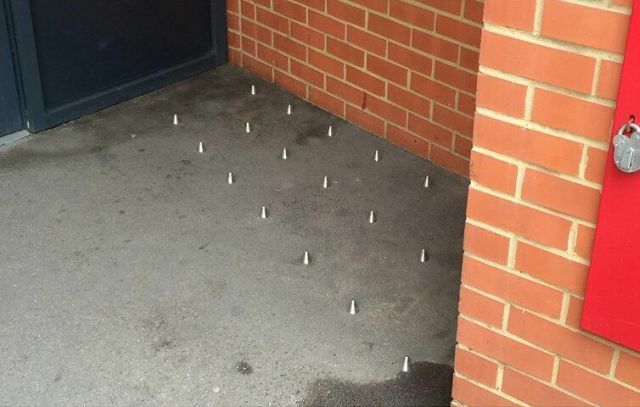 There has been outrage over the appearance of studs, or spikes, embedded into the ground by the entrance of 118 Southwark Bridge Road, which are designed to deter rough sleeping. Katharine Sacks-Jones, head of policy and campaigns at Crisis, said, "We will never tackle rough sleeping with studs in the pavement. Instead we must deal with the causes". Boris Johnson and Green Assembly Member Jenny Jones have both called on the studs to be removed, with Jenny adding, "instead of trying to deter people who are in a desperate situation, these building owners should be contacting homeless services to ensure anyone sleeping rough on their land is helped". "Part of [our] role is to prevent people adopting a street lifestyle which, on occasions, means adapting the physical environment to prevent people sleeping rough in a particular location on a regular basis. These 'studs' appear a rather brutal way of doing just that. However to undertake such measures without providing the necessary assistance to people who sleep rough is wrong — the aim is to help people move in, not just move on... People's reaction to this story has shown the depth of compassion and concern for people sleeping rough. We need to harness that to help people on the streets now, but also to prevent more people ending up there in the future." What doesn't seem clear is whether the building's owners have been working in conjunction with local homelessness workers to support any rough sleepers who may have been using the doorway. But in and of themselves, the use of anti-rough sleeping measures aren't wrong. We spoke to Petra Salva, NSNO director, last year and she explained the difficulties in helping people once they acclimatise to living on the streets, which can take a remarkably short amount of time. It's a sentiment echoed in a blog post by a nurse and former outreach worker, which also found traction on Twitter over the weekend. Media attention has prompted Southwark Council to investigate removing the studs, but this seems like a kneejerk reaction. Would we rather the studs were removed to allow people to sleep there, or would we rather the people who used to sleep there got help? Taking the studs out again won't solve anything; presumably a better response would be to make sure that no street design changes can be made without the involvement of qualified outreach workers who can advise and help anyone who'd be affected.